Why Buy From Jimmy Britt CDJR? Putting you and your automotive needs first isn't just a priority -- it's a passion. 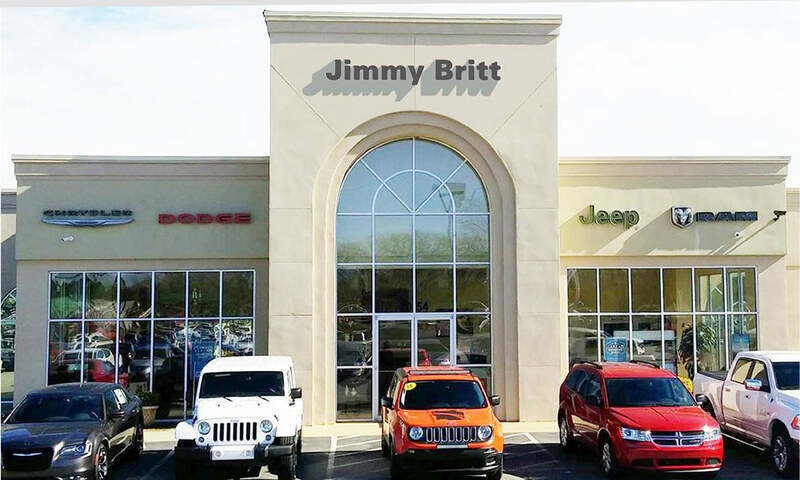 At Jimmy Britt Chrysler Dodge Jeep Ram, we pride ourselves on delivering genuine sales with incredible service. Our state-of-the-art Chrysler, Dodge, Ram and Jeep dealership in Dublin, GA, has been a long-standing member of the Dublin community, and has stood as an example of high-quality service in the Central Georgia region. We treat our customers with the honesty, transparency and respect they deserve, because we want to deliver the ultimate dealership experience. After all, nothing tops seeing you leave with a smile. When you visit our Dublin Ram dealership, you won't struggle to find a new, used or Certified Pre-Owned vehicle. Jimmy Britt Chrysler Dodge Jeep Ram offers a top-notch selection, making it easy to find the perfect new or used car for your lifestyle and budget. We pair our vehicles with outstanding Jeep lease and finance specials, and we carry our impressive savings over to our Chrysler service center. When you schedule Jeep service with us, you'll be able to save on your next oil change, tire rotation and other Dodge repairs. In fact, you can get a quick battery and alignment check for free! Just schedule Dodge service at our local Jeep dealership and visit us whenever is convenient to you. Get directions to Jimmy Britt Chrysler Dodge Jeep Ram and see for yourself why Georgia drivers place their trust in the Jimmy Britt name. Looking for More Reasons to Buy from Jimmy Britt Chrysler Dodge Jeep Ram? Our Dublin Dodge dealership is your go-to destination for Certified Pre-Owned vehicles. Every one of our CPO cars for sale has passed a rigorous 125-point inspection and comes with a complimentary CARFAX® Vehicle History Report for your peace of mind. Jimmy Britt Chrysler Dodge Jeep Ram is a Ram Commercial Dealer. When you want to build your commercial Ram fleet, visit us to buy a commercial Ram truck or ProMaster van. We'll enroll you in our free Ram BusinessLink program and help you save with Ram On the Job incentives! Jimmy Britt Chrysler Dodge Jeep Ram offers a $500 Jeep Military Discount to help show our appreciation for the brave men and women of the U.S. Armed Forces. We offer expedited Ram service to help you get in and out of our service bays quickly. We also offer a convenient shuttle service if you don't want to wait for your Dodge repairs. Or, we can find you a loaner car or rental car to help you carry out your day uninterrupted. If you do want to wait for your Chrysler maintenance and repairs, you can relax in our comfy customer lounge that offers complimentary coffee, popcorn and Wi-Fi. Our Dublin Chrysler dealership is your one-stop shop for authentic Mopar parts and accessories. Shop our OEM Ram parts inventory and buy the Jeep accessories you need to customize your drives! If you want to enjoy a dealership experience tailored exactly to you and your needs, come buy, lease or service at Jimmy Britt Chrysler Dodge Jeep Ram. We look forward to working with you soon!